If you enjoyed The Odd Squad: Bully Bait (KBR review), you’ll love Zero Tolerance. It’s more of the same sort of humour, but with a darker undertone. While Nick is being his usual scheming doofus, and once more, his genius plots go wrong, there’s a villain at large and he or she is making Nick’s life a misery. Put the two storylines together and there is confusion, mistaken identities, bad breath and disgusting chewing gum-a-robics. How far would you go to make new friends? How about protecting the ones you’ve got: how far would you go to protect them? And what would you put up with before you say enough is enough? Hidden beneath the jokes and funny situations are some timeless gems of wisdom. Who could blame a girl for wanting to have a friend who is the same gender, but does that mean old friends get the boot? Karl, who is afraid of pretty much everything, shows just how big a friend he can be and his throwaway lines always makes me think. 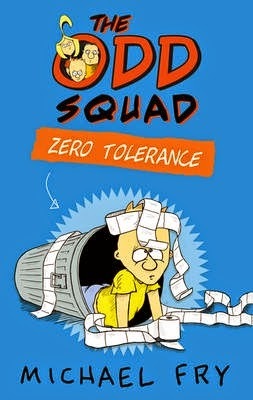 The Odd Squad: Zero Tolerance might be funny, but it is full of heart and wisdom and topped with a generous dash of courage.